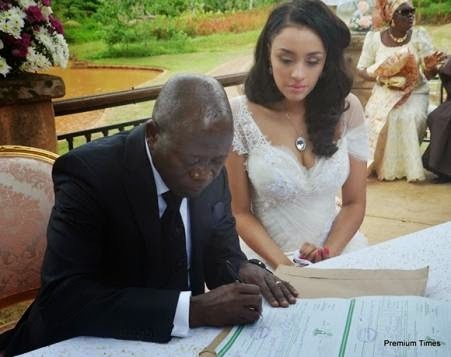 After his 54 year old wife Clara died of cancer five years ago, 63 yea old Adams Aliyu Oshiomhole has married a beautiful model from Cape Verde Islands. 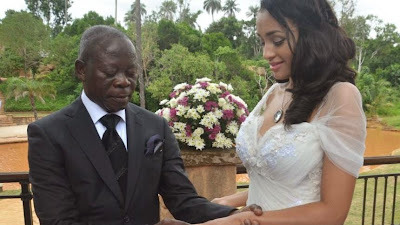 Oshiomhole's new Wife Iara is 36 and a lawyer by profession and a model. She was formerly working at Emirates Airlines as air hostess, which makes you wonder why she would decide to marry a 63 ear old man. "The couple has shown true love and patience in their dealings with one another" said the chairman of the ceremony who is also a former Head of State, Yakubu Gowon. 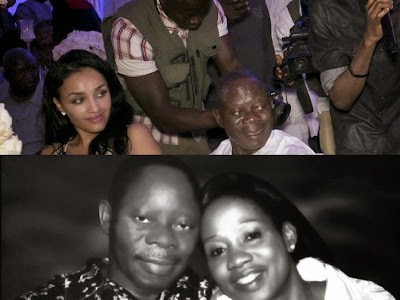 The ceremony was also attended by the president elect Muhammadu Buhari, who is a close friend of Oshiomhole. Here is how things were.